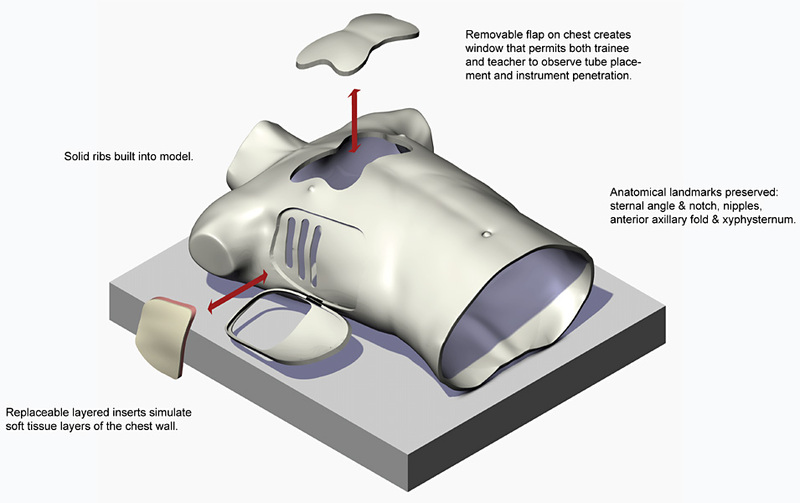 This illustration shows the physical features of a new bench model used for teaching chest tube insertion. I worked with pediatric emergency physician Dr Samim Al-Qadhi to develop a physical benchtop simulation of pediatric chest tube insertion. Pediatric chest tube insertion is a difficult skill to master for emergency room physicians. These physicians are infrequently required to perform the procedure but their is little room for error when they do; botched attempts can easily lead to collapsed lungs. Dr Al-Qadhi, believed that existing bench models used for teaching provided too little visual feedback to trainees about the location of their instruments; feedback that if present, he believed would result in increased rate in the acquisition of procedure performance proficiency.